Our pet guinea pig passed on today. Nothing quite startles you like seeing a beloved pet lying not quite right, and you have to do the whole cage shake thing to make sure they aren't just resting. 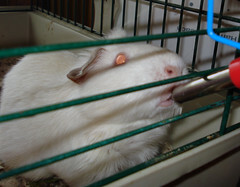 She was a rescue from the Lawrence Humane Society, one of over 100 piggies seized from an unlicensed animal testing lab. We picked her out because she was an adult and albino-looking, thus we figured a bit less likely to get adopted right away with little hoppers and more aethetic adult piggies in plentiful supply. We brought her home April 20th, 2001. She supplied us with companionship and cute sounds, we gave her Cheerios. She will be missed. She was probably about 7 years old, which is pretty old for a piggie. Sorry to hear. We lost our cat of 11 years this past January. I'm sure she knew she was loved. Oh, I'm sorry to hear about your piggie. She was a cutie. Aww, so sorry to hear that.